For the six or eight people in the world who (a) think Segways are cool and (b) managed to procreate, here’s a junior Segway for their kids. I think this may have hit the market around $500, and has been steadily marked down since. It’s on sale at Toys R Us at the moment for $200. This entry was posted in Not quite a scooter on November 14, 2014 by stern. Hey, those teeth look pretty big. I wonder what they will look like after he face plants. 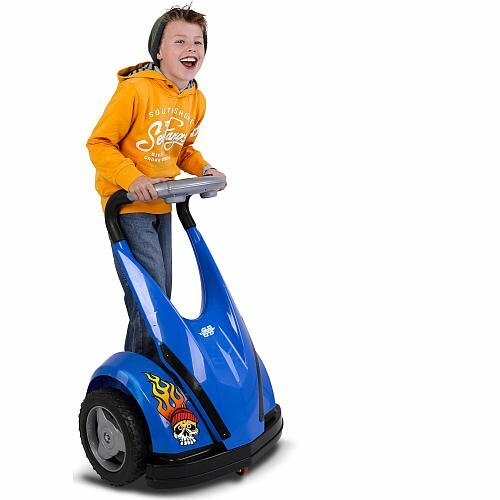 According to the online reviews, the hard plastic wheels get no purchase on any surface, leaving the child standing awkwardly on the platform while the wheels spin impotently. In good news, little risk of face planting.